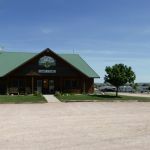 Ask fellow campers about "Heartland RV Park & Cabins" and nearby attractions. Question: How is the WIFI - good enough to check email?? Looks like there is a lot of traffic noise at this park - is that right?? Answer: The traffic noise really wasn't bad. If you are outside you can hear the traffic and it is pretty constant, but inside your RV we really didn't notice it. The wifi, on the other hand, was very poor. No, you could not even check email, much less do any simply web surfing or checking social media. We stayed here in the off season so sites were easy to get. Check in was pleasant and efficient. Sites are open and our site was very muddy because of rain. This mud sticks to your shoes and dog's feet and doesn't want to come off. Our site was level and we had good wifi. We were given a site towards the back so the road noise from the highway didn't disturb us. We camped at Heartland RV Park & Cabins in a Motorhome. Close to Custer SP, Mt Rushmore and the Badlands. The site was mostly level and the trees are still short so it did not interfere with satellite reception. It had rained earlier in the day so the site was muddy along with the internal park streets. The RV park is growing. They are adding an event center along with at least another 50 sites. Had to park my tow car across the road since there are not many sites that can fit a total length of 55 feet. Wifi and t-mobile service was very good. 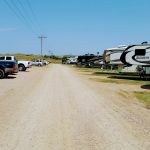 We camped at Heartland RV Park & Cabins in a Motorhome. The city of Custer is a charming town with several good restaurants. Custer state park is a very nice park with wildlife near the road. So drive slow. You can also pay the park fee $20 for a week where you can go through the wildlife loop road, 18 miles, and see up close buffalos and other wildlife. Less than .5 miles away is Lentz Brothers Pizza in Hermosa. Very good pizza. The best in the state according to Yelp. I do not like RV Parks especially when they are really not much more than parking lots. That said, the Heartland RV Park was well-located for our excursions around the Mt. Rushmore/Crazy Horse monuments. The place was cleaned and nicely maintained, WiFi was good, the pool was fine but the hot tub was out of service for our brief stay. Two negatives: the park is on a mild slope so you must level-up and if it rains there is mud that is not quite as sticky as Montana gumbo mud. The crew does its best to keep the sites groomed, but fighting the mud is an uphill battle. The staff is helpful. I would recommend Heartland. If you are planning an extended stay I'd suggest a more scenic and level location. We camped at Heartland RV Park & Cabins in a Motorhome. Easy to find. Interior roads and sites are gravel. Moved from site 308 to 314 because it was just a bit too short for our rig to fit comfortably. Had to park the tow in designated parking down the road from the site. There is road noise but it's fairly quiet at night except for when the train goes by. That's not every night. Very good location for Custer State Park, Mt. Rushmore, Crazy Horse and small towns in the area. Laundry room was very clean. 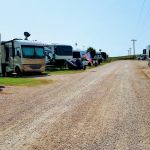 We camped at Heartland RV Park & Cabins in a Motorhome. Visit the Mammoth Site in Hot Springs. Very educational. Pizza at the nearby pizza place was good, wings not so much. We visited several years ago when campground was only 1-2 years old. There was a problem with water and mud whenever it rained and that hasn't changed despite the fact that the campground has 6 times as many sites and is adding 100 more (wider and longer). Roads gravel, pull-thru sites. When site is empty, it is 'dragged' to remove ruts. There is little drainage and each rainstorm causes the silt that runs into the campground to become liquid mud that is almost impossible to clean off. It appears that the owner is more interested in profit than the comfort of the guests. Several long-term residents. Restrooms, laundry rooms clean and well-stocked. Staff very helpful. Limited number of Passport America sites with unlimited stay at a 20% discount. Would return to the area but not to this park. We camped at Heartland RV Park & Cabins in a Fifth Wheel. About 20 miles from Rapid City. Custer State Park, Mount Rushmore, Crazy Horse Monument, City of Custer, Jewel Cave and Wind Cave National Parks, Mammoth Site and Hot Springs within about a 50-mile radius. Shopping in Rapid City. New pizza shop about 3 miles away off highway to Rapid City - pizza is delicious!! Air Force base with air museum east of Rapid City. Loved this park - great value given that they allowed us to use the PPA discount for the 6 nights we were there. Staff were all very friendly -was there dust - yes some but not a huge deal. Would stay here again. We camped at Heartland RV Park & Cabins in a Motorhome. Very central location to many area attractions - Custer State Park (highly recommended), Badlands NP, Mt Rushmore, etc. Well kept campground and convenient highway access. Sites are very close together. Hookups are good including cable. Laundry facilities excellent. Check in process was rather detailed and cumbersome. I had to return to my vehicle twice to get additional information that was requested upon check in. Interior roads are dirt so that leads to some dust. Signage for where to check in is confusing. For visiting the national parks both around Custer SP and Badlands, this was a good central point. We camped at Heartland RV Park & Cabins in a Travel Trailer. This park is very basic at best. The workers were friendly as others have said but that does not make up for the very tight roads and spacing, the poor gravel over dirt roads/sites and the long term residents' run down "RVs" with crap stored all around and under them. This park is just ugly which is in contrast to the beautiful area that it is located in. Do not believe either their web site or their friendly folks about site sizes. They are much smaller than stated. Luckily we were passing through and were there for one night only. There are lots of better choices in this area. Location good! Park? Not so much! We camped at Heartland RV Park & Cabins in a Fifth Wheel. We have stayed here 3 times in the past 10 years but those were in late August or early September when the park was less than half full. Now, at the peak of the family travel season in July, it is much more crowded and that makes a big difference. The small pool, bathrooms, laundry, and Wi-Fi were overburdened. As usual we had a standard, gravel, FHU pull through site. It wasn't completely level but big enough for our class C. The $20 Passport America rate for multiple days at this time of year makes full park problems bearable. The cable TV is minimal but most sites appear to be satellite friendly. The staff was friendly even though very busy. I didn't see any recycling. We camped at Heartland RV Park & Cabins in a Motorhome. Big rig friendly campground right off highway. Noise is not too bad. Good 50amp service, water, sewer, cable, and wifi worked! It is gravel sites with grass between sites and dirt roads through park. It poured rain for three days straight. Yes, there was some mud...it happens. Use blocks under jacks in case it rains. What I saw was every time it was a little dry, park maintenance was working the roads and sites to smooth them and replace gravel. The staff was friendly and sends you welcome and pre-departure emails. We camped at Heartland RV Park & Cabins in a Motorhome. Good park for easy access to Rushmore, Crazy Horse, Custer State Park and more. Bonus...Flying J 1 Mile away had best price around on fuel. This COULD be a decent campground if management took initiative to maintain the roads. We were unfortunate to be there during a rainy period and the roads were a MUDDY MESS! I realize management has no control over the weather but could be much better prepared if the roads were properly maintained. I recommend if you decide to stay here to not pay extra for a "large" site as we did. After barely getting in without any of the unit still in the road front or rear we wouldn't have had enough room to park a bike if we wanted to. I will NEVER stay here again. We camped at Heartland RV Park & Cabins in a Fifth Wheel. My DH and I stayed at this CG for a week. The employees were extremely nice and helpful. They are expanding the campground to add tons more sites so there was dust (and mud) throughout the sites. The small grassy dog walk area always had some dog poop in it (what's wrong with some people?) Although its listed in the regulations (and is common decency) to clean up after you pets, maybe some signs and poop bags could help the situation? Our site was long enough for our RV but we needed to park our car across the road which was not far at all. We loved the various activities this area has to offer and very much enjoyed our time here. We camped at Heartland RV Park & Cabins in a Motorhome. Read the reviews about the mud and noise. We had no mud for the week we were here. Yes there is some road noise from the highway but nothing like some reported. I take it as normal street noise you would get anywhere in a camp grounds with FHU. I think for a weeks stay it's acceptable. Would I want to stay here 2, 3, or more months? Probably not as the sites are too close for my liking and there were no trees for shade. My site was just long enough for my 39' 5th wheel. Once unhooked I had to park across the road which really didn't bother me as it was in front of our trailer. Plus there was room for our other vehicle. We camped at Heartland RV Park & Cabins in a Fifth Wheel. We have stayed here several times and each time new improvements are being made. The sites are level, good wifi at the site, and central hook ups. A new item we noticed was after arrival we received an email with a welcome note and several links to surrounding things to do including directions. We camped at Heartland RV Park & Cabins in a Fifth Wheel. 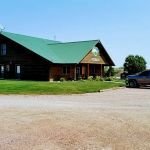 This is a good location for visiting all the local attractions in the Black Hills area. Lentz Bros. Pizza was great and close to the park near the junction of Highways 79 and 36. Close to entrance of Custer SP. We went into park 3 days this time, this is a good time of year to go to park . We went to the Wild Horse Sanctuary near Hot Springs. We did not go to Wind Cave this time but did last time here. We have been in this park before and liked its location . Good pizza place nearby. Diesel prices good at Flying J nearby. Custer state park is amazing. Aside from the obvious draw of Custer State Park and the Black Hills, Lintz Brothers Pizza is just a couple of minutes away - good pizza! Walmart is in Rapid City, about 25 minutes away. Perfect location while visiting Mt. Rushmore, Chief Crazy Horse, Custer State Park, and the Badlands National Park. Park farthest from the road for a quieter location. We visited most of the attractions in the area. If going north from Denver we took I-25 to I-85 to 18 and then over to 79. Roads were fabulous for 45' towing. Little traffic after leaving Denver area. Don't arrive after dark because park isn't lit well for arrivals then though park is right off Highway 79. Easy to miss when heading North, MM79 on left if traveling North. Lots of maps and brochures in the office and a video on campground website for car trip. Custer State Park, Mount Rushmore and many other day trips available. I would plan on staying a week to see everything the Black Hills has to offer. It's very beautiful. Very close to Mount Rushmore and other attractions. Short drive to Custer State Park, Mt. Rushmore and other attractions in Black Hills. Must see: Mt Rushmore Nat'l Monument, Custer State Park (Needles highway and Wildlife Loop), Crazy Horse Memorial, Rushmore Cave, Deadwood, Spearfish...too many to name. The pizza restaurant about 1 mile north is pretty good. and the Flying J about 2 miles north had the best diesel price (w/Good Sam discount) in the area. Convenient to Rushmore and other sites. Mount Rushmore Nat'l Park, Windcave, Jewel Cave. Elsworth Airforce base is also great and a MUST SEE is the Blackhills Wildhorse Sanctuary near Hotsprings. They do tours the horses and nature are great. Fuel, pizza and major access roads to the Black Hills within a half mile. Wal-Mart 17 miles north in Rapid City. If driving across Custer State Park allow 45 minutes due to the 35 mph speed limits and possible "buffalo jams." Less traffic encountered during morning hours if traveling to Mt Rushmore, etc. Its about a 15-20 minuted drive up to rapid city, custer state park is about a hour or so. If you leave the park, take a left and then the first left off the highway (theres a gas station). It takes you to custer park, there is a road as you enter the park named Iron Mountain Road. Take that up to MT. Rushmore for a beautiful scenic drive of the Black hills. Custer State Park is close by. Wal-Mart is in Rapid City about 18 miles away. Wind Cave is about 45 minutes drive south. Crazy Horse and Mt. Rushmore are both about 40 minutes away. While in Rapid City, do take the Walk of Presidents downtown. You might even learn something about our former Presidents. Easy to navigate to all the South Dakota sights. Lintz Bros pizza is best we have ever had. The Black Hills cover a large area. Heartland is very convenient for the area south of Mt. Rushmore which includes the "natural" attractions such as Custer State Park and Wind Cave National Park. (North of Rushmore, although beautiful, the auto and motorcycle interests dominate along with the casinos.) Heartland is also convenient to entering the Badlands NP from the south that also offers a side trip to Wounded Knee on the Pine Ridge Reservation. Make sure you have what you need when you get there. It is not near anything but the highway. Convenient to Mt. Rushmore, Crazy Horse. Wild life loop at Custer State Park a big disappointment, $15 and not a glimpse of anything. Close to Custer State Park and Mt Rushmore. Highly recommend Badlands, Crazy Horse Memorial, Mount Rushmore, Custard State Park, Ironman scenic byway, Needles scenic Highway , Spearfish. Shopping in Rapid City. Convenient to the Black Hills, Mt. Rushmore, Crazy Horse, Badlands, Custer State Park and only 15 miles south of Rapid City. Are you affiliated with Heartland RV Park & Cabins ?